"Don't carry a concealed weapon until you have contacted Affordable Family Insurance and reviewd your policies!" Most WI Concealed Carry license holders are under the incorrect assumption their home or personal liability umbrella policy will cover them and is an unnecessary risk that can be avoided easily with the proper coverage in place. 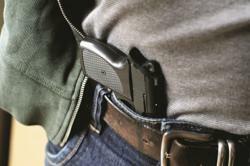 As of April 24, 2012 the Wisconsin Department of Justice had issued over 101,000 Concealed Carry Licenses and is receiving 200-400 license applications each day. According to the DOJ, this number far surpasses their prediction of the 125,000 licenses they thought would be issued in the entire first year of allowing Concealed Carry. With so many licensees comes another side to the equation…will your insurance cover you? Wisconsin has adopted the Castle Doctrine which does provide protection for gun owners involved in shootings occurring in their home, car or business, but it does not provide any immunity for the use of a weapon outside of these areas. This leaves a very large void for WI Concealed Carry license holders who engage in a self-defense shooting while they are out in public as they will likely have to pay legal fees to talk with the District Attorney, especially if charged with a crime. They can also be sued in civil court by their target, the target’s family, the business owner where the shooting occurs or other bystanders for their actions. Affordable Family Insurance in Madison, WI has become the leading information source for Concealed Carry license holders in the Midwest to get the proper protection in the event they are involved in a self-defense incident. Monge has done extensive study of self-defense coverage and has put together a comprehensive program to insure their clients properly. The program includes a membership to pay all legal fees arising out of a self-defense incident directly for the member as well as insurance coverage for civil liability that allows for self-defense with limits starting at $1,000,000.00. Monge says anyone with questions on their current coverage can call him to review their policies and should do so prior to carrying a weapon in public. For more information and interview requests please contact Chris Monge at Affordable Family Insurance in Madison, WI at 608-238-5800 or via email at cmonge(at)tds(dot)net.